The Big Shop is an 8000 square foot space that has been transformed into a wood shop within which tenants' bench space ranges from 120 sq.' to 400 sq. feet. The wide spectrum of talent is made up of 16 independent designers and artisans. Collaboration is intrinsic to the group and it is not unusual for projects to be shared between people. The machinery is industrial grade, including one vertical and one horizontal panel saw, three table saws, 36” band saw, two 24"planers, 16” joiner, 36” wide belt sander, 60” edge sander, heavy power and air, bridge crane, forklift access, two-bay spray booth and heated drying room, heated break room with wi-fi. All shop equipment maintenance and facilities up-keep are inclusive. 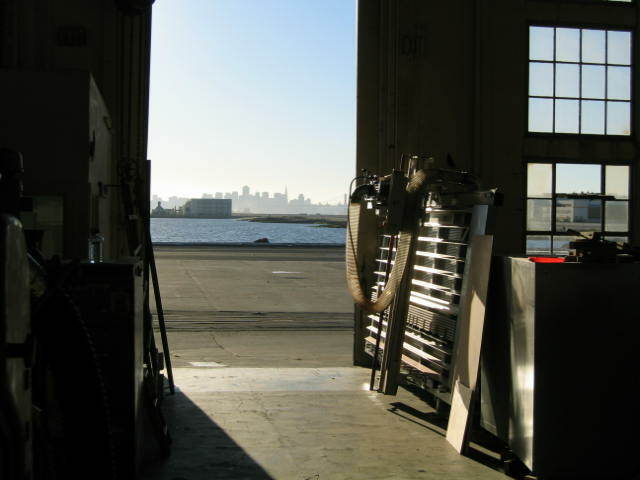 View out the Big Shop's main doors to the Sea Plane Lagoon and San Francisco beyond. View looking to the rear of the Big Shop.